Kraton polymers have a unique molecular structure, which when mixed with bitumen, enhances its durability by adding flexibility, elasticity and toughness over a wide temperature range. These features reduce the bitumen’s sensitivity to extreme temperatures and significantly enhance its performance properties. The composition of Kraton™ D enables polystyrene blocks to combine into hard solid islands in a sea of polybutadiene chains. The rubbery polybutadiene connects the different polystyrene islands to form a network, but it remains rubbery even at temperatures as low as -90°C. Polystyrene remains solid up to the polystyrene glass transition temperature at around 100°C. The resulting Kraton D polymer has rubbery properties over a range of temperatures. This network structure is strong at temperatures up to 100°C. Since the structure is based on the polystyrene domain’s physical reversible bonds, at higher temperatures the network breaks up into individual SB and SBS molecules. Re-establishment of the network occurs on cooling. This reversible network is a key contributor to the polymer’s versatility. 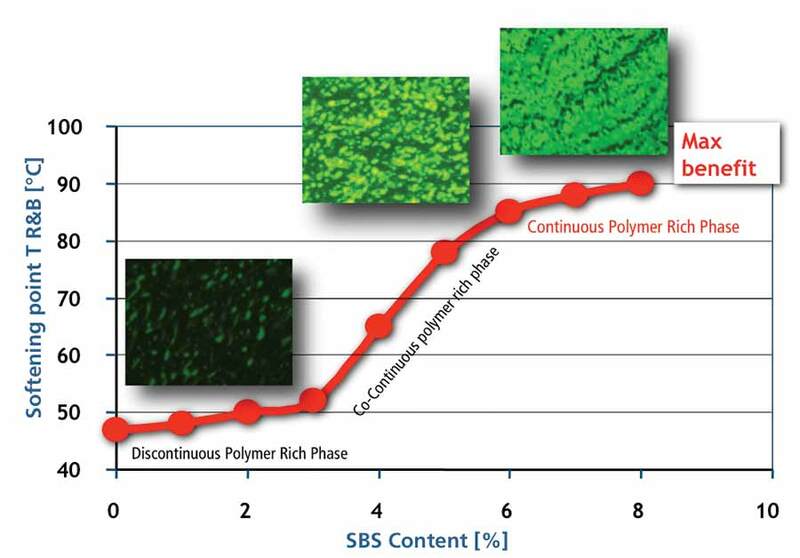 Kraton™ D SBS polymer has similar solution parameters as the bitumen’s maltenes phase. It can absorb several times its own weight of bituminous components, and the extended polymer can occupy a substantial volume fraction of the blend, even at low concentrations. At a concentration of three percent in highly-compatible bitumen, the polymer-rich phase may achieve co-continuity with the other (asphaltene-rich) phase. Bitumen composition is important in the final properties of the blend and the level of compatibility. Certain carefully-selected bitumen can have a single phase structure at temperatures higher than 130°C. The aromaticity and the average molecular weight of the maltenes phase determine the weakening of the styrene domains, and hence the empirical properties, such as softening point. The compatibility of bitumen and polymer is key to the modification’s success. Kraton polymers are ideally suited for blending with bitumen because of its similar average solubility parameters and ability to absorb the bitumen's oily components while maintaining the network structure. This unique combination where a small amount of polymer creates a network structure in the bitumen by absorbing its components and increasing its effective volume are integral to the success of Kraton D polymer modified bitumen. Bitumen is turned from a highly viscous material into a bituminous elastomer, with the key advantages of elastic behavior over a wider temperature range. With the right choice of bitumen, polymer concentration and polymer structure, the temperature range can be extended to cover nearly any climate. Bitumen consists of a mixture of larger and smaller molecules, some of which are oil-like, and are absorbed by the polymer. These oil-like components also act to dissolve the larger molecules (asphaltenes), but when the polymer absorbs too much oily solvents, a phase separation can occur where an asphaltene-rich layer forms at the bottom and a polymer rich layer forms at the top of the mixture. The S curve clearly shows the dramatic impact of a small amount of polymer on empirical properties such as Softening Point. Although the S-curve does not reflect the performance level that can be achieved at the various polymer contents, it illustrates that securing complete dissolving and avoiding degeneration due to severe processing conditions are important to obtain a certain performance level. Elongation shows that highly modified (+/-12%) test samples can be extended 20 times its original length before failure. The breaking stress increased by a factor 20 to 30. Cold bend indicates its flexibility and non-brittle behavior at very low temperatures.